Since Unite Me (2014) and, more importantly, Ignite Me (2014) only came out yesterday, I’m hesitant to write one of my more descriptive reviews. I don’t want to ruin someone’s life by accidentally blurting something out. 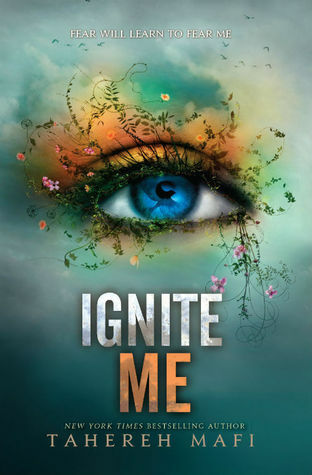 What I will say is that Ignite Me is PERFECT, but this series has a little bit ruined my life. I had hoped that reading the companion novellas and the finale would give me a sense of closure and assuage the obsession that began with Shatter Me. While Ignite Me has a perfectly fine ending, all it made me want to do is go back to the start and reread every last syllable knowing what I know now. There is something about these books, about the way the characters are written and the beautiful way Mafi uses language, that gets under my skin and into my heart and won’t let go. It’s something I haven’t had the pleasure of experiencing very often in all of my reading years, and as a result I am a Tahereh Mafi fan for life. She could write a physics textbook, and I’d give it a place of honour on my shelf.